The Sushi Awards, sponsored by Kikkoman, S&B and Yutaka, were started way back in 2001 as a way to demonstrate to the UK how yummy and versatile sushi can be. HYPER JAPAN 2013 saw the third outing of the Sushi Award’s Sushi Roll Championship, which saw five UK based Japanese restaurants battling out to see whose unique sushi creation would be the people’s favourite. This year’s proud winner was Eat Tokyo Group Head Chef Yoshiro Motohashi, with his sublimely delicious Tokyo Special Roll. The Eat Tokyo Group has five branches across London, and a reputation as one of the city’s most formidable Japanese chains. Drawing on over 40 years’ experience in the catering trade in Tokyo, the Group offers a wide range of authentic Japanese dishes including freshly prepared sushi, bento boxes, and an izakaya menu. What’s more, the Group is committed to doing it all at prices that defy the stereotype that quality Japanese food has to hit the pocket hard. The group’s appreciation of what the UK public will admire in Japanese food is really evident in the sumptuous Tokyo Special. This bold and colourful roll was inspired by dynamic and cosmopolitan Tokyo. Eel, prawn and avocado are layered in perfectly cooked Yutaka Premium Sushi Rice then double-wrapped in seared salmon and yellowtail. The roll is then lightly flamed before being smothered in tobiko, wasabi tobiko, and S&B Wasabi Sauce. A tsume glaze made with Kikkoman Soy Sauce provides sweetness and a rich umami punch. The soft salmon melts into creamy avocado, while the prawn and eel give the roll bite, followed by a whisper of wasabi. A truly indulgent mouthful of Tokyo. This bold and colourful roll was inspired by dynamic and cosmopolitan Tokyo. 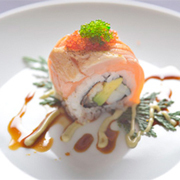 Eel, prawn and avocado are layered in Yutaka Premium Sushi Rice then double-wrapped in seared salmon and yellowtail. The roll is then lightly flamed before being smothered in tobiko, wasabi tobiko, and S&B Wasabi Sauce. A tsume glaze made with KIKKOMAN Soy Sauce provides sweetness and a rich umami punch. The soft salmon melts into creamy avocado, while the prawn and eel give the roll bite, followed by a whisper of wasabi. A truly indulgent mouthful of Tokyo. After two decades building up vast experience as a professional chef in Japan, Chef Motohashi came to the UK where he worked in a number of Head Chef roles in leading Japanese restaurants. Now, as Group Head Chef of the Eat Tokyo Group, he has overall responsibility for menu development. Chef Motohashi finds his inspiration in creating for the customer the sense of pleasure felt when food is served and the sensuous pleasure of eating. He aims to keep his food traditional while always remaining focused on customer satisfaction.